Tags: Immunohiostochemistry, Successful Research Tips, We Are Enzo! Enzo Life Sciences now provides 40 years of experience in the supply of research kits, biochemicals and biologicals. As Scientists Enabling Scientists, Enzo Life Sciences realizes the value in providing relevant information to our customers working in the fields of life science, drug development and clinical research. We are happy to provide simple but useful tips for improving daily tasks as well as the overall quality of your research. With this in mind, here is an inexhaustive list of tips compiled by Enzo Life Sciences for achieving high quality data by immunohistochemistry, a widely used biological technique allowing the end user not only to analyze the anatomy of the tissue of interest but also to visualize the distribution, the localization and the intensity of the expression of a specific antigen or cellular components in tissue sections. When designing your experiment, tissue preparation is key and much thought must be put into it. Two options are at your disposal. You can either freeze your tissue or fix it in formalin and embed it in paraffin. Both of these techniques present drawbacks. Freezing tissue may lead to a loss of morphological integrity while embedding tissue may cause cell shrinkage, which may ultimately result in higher antigen density over a given tissue area. Whichever tissue preparation you decide to go ahead with, please ensure a smooth and uniform sectioning of your tissue using either a cryostat for frozen tissue or a microtome for formalin-fixed paraffin-embedded tissue. Your fixative solution may influence either negatively or positively the quality of your staining. The type of fixative and its concentration, the pH, the duration of the fixation and the use of additives such as picric acid are all criteria to take into account when fixing your tissue. The choice of fixation will largely depend on the age of the tissue (e.g. neonatal), tissue type (e.g. brain) and the nature of the antigen you are interested in (e.g. soluble proteins). We would strongly advise to perform a literature search to find out how other scientists might have prepared your tissue of interest. As a result of fixation, the antigen can be masked making it impossible for the antibody to bind to its target. Heating/boiling your tissue in an acidic buffer or enzymatically digesting your tissue with the help of proteases can help with the antigen retrieval. There is, however, a risk of altering the morphology of the tissue or even the integrity of the antigen itself when performing an enzymatic digestion. We would, therefore, recommend using heat-induced epitope retrieval rather than proteolytic-induced antigen unmasking unless stated otherwise by the antibody manufacturer. Failure to obtain a good IHC staining can come from an inappropriate or insufficient antigen retrieval process. We would advise you to repeat your experiment with an alkaline antigen retrieval buffer, which can be either citrate-, EDTA- or Tris-based. In addition, temperature and duration of the antigen retrieval can also be optimized. Once again, looking through the literature might bring you the answer you need for your antigen of interest. Please note that a control sample, which has not undergone heat-induced antigen retrieval, should also be included in order to eliminate any potential artifact caused by this procedure. Please be mindful of the fact that your tissue might express unwanted contents, which may not only interfere with your IHC staining but also dramatically affect its interpretation. False positives can be caused by the presence of endogenous biotin when using avidin-biotin or streptavidin-biotin detection systems. You should, therefore, consider the use of avidin-biotin blocking systems. Alkaline phosphatase and peroxidases are also naturally expressed by most tissues and can generate artifacts when using alkaline phosphatase- or horseradish peroxidase (HRP)-conjugated secondary antibodies. 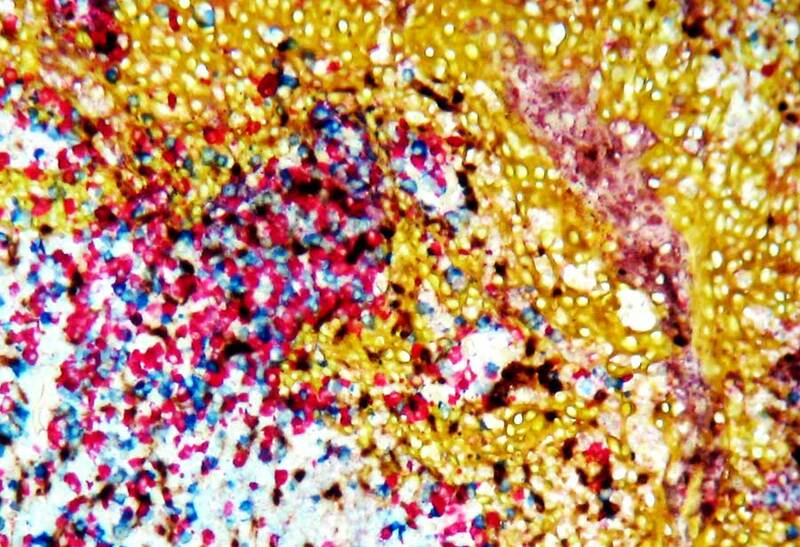 Blocking of endogenous enzymes using an IHC tissue primer is therefore paramount in order to guarantee the specificity of your staining. Non-specific binding of your antibody to your tissue can occur mainly because of the presence of Fc receptors. Blocking of the non-specific binding sites is, consequently, an important step in your IHC process. This is typically done prior to the incubation with the primary antibody using a normal serum from the same species as the one in which the secondary antibody was generated in. Failure to have access to such serum or when conducting a multiplexing experiment with secondary antibodies from different species, a universal IHC background blocker may represent a valid and versatile alternative. Increasing the blocking time may also help with diminishing background. Tissue and tissue sections are sometimes difficult to get your hands on and are considered precious materials. That is why it is important to truly characterize and understand your antibody of interest. Testing the antibody performance and its specificity by Western blot should bring you the first clue as to the suitability of your antibody for immunohistochemistry. You can, for example, use relevant positive and negative cell lysates. As mentioned above, the efficiency of the antigen retrieval process can vary and a polyclonal antibody should always be preferred when establishing a new IHC protocol, the main reason being that it will give you access to multiple binding sites instead of a single one when using a monoclonal antibody. Similarly to flow cytometry and Western blot, titration should take place to determine your working antibody concentration. This can be typically done using positive and negative cells embedded in paraffin. Please note that determining the optimal dilution should be carried out for both the primary and the secondary antibody. The choice of detection system can seriously impact the quality of your results. This choice depends on the levels of expression of your target of interest. Conjugated primary antibodies should always be preferred when looking at highly expressed antigens. For low-to-medium abundant proteins, we would strongly advise you to use conjugated secondary antibodies, mainly because of their signal amplification potential. Avidin-biotin and streptavidin-biotin are the most commonly used detection systems in the IHC field. Despite the best efforts to block endogenous biotin, non-specific staining can occur with this system. There are nowadays alternatives, which allow a crispier, more specific and more intense staining. These alternatives rely on enzyme-conjugated polymer reagents. They also have the added advantage of allowing you to reduce the amount of primary antibody being used. It may seem obvious but the choice of chromogen should not depend on your favorite staining color alone. Staining accuracy, staining intensity and compatibility with counterstains and mounting media should all come into the equation. Taking as an example the DAB substrate for HRP-based detection systems, it is the substrate of choice due to its speed of reaction, its precise deposit and its compatibility with commonly used counterstains and permanent organic mounting media. It is worth mentioning that Enzo Life Sciences offers the broadest and most versatile palette of high definition chromogens to choose from, giving you the ultimate flexibility in designing your IHC experiment. Our selection includes unique yellow, black and blue HRP chromogens. Combined with our biotin-free nanopolymer-based detection systems, you can envisage multiplexing IHC protocols for an efficient detection of multiple antigens in a single tissue sample and easier correlations between the expressions of different markers. It also allows you to preserve tissue while reducing reagent and labor costs. Counterstaining is a key step in your IHC process and should not be overlooked. It provides background contrast as well as perspective by highlighting the nuclei. Fast red, Hematoxylin, methyl green and toluidine blue are commonly used chromogenic counterstains. When multiplexing your IHC staining with different markers and consequently different chromogens, you should keep in mind that your counterstain will need to stand out and provide true background contrast. Please also note that some of the chromogens mentioned above and counterstains are not compatible with organic solvents and organic mounting medium. Aqueous mounting medium such as our HIGHDEF® IHC mount, which has a very high refractive index similar to organic mounting media, should therefore be considered to protect not only the specimen but also your IHC staining in a permanent manner. Like for any experiments, controls are crucial and should allow you to publish confidently your IHC data. Positive controls will be an indication that your protocol is working. This is usually done using a tissue known to express the antigen or marker of interest. Online databases such as GeneCards, Human Protein Atlas or Uniprot should help you find the appropriate positive controls for your experiment. Negative controls will guarantee the specificity of your IHC staining. Knock-out or knock-down tissue samples are recommended. They should be used alongside a no-primary control as well as an isotype control.